The Newport Series by Coastal Shower Doors offers affordable luxury in a framed bypass/sliding shower door system. 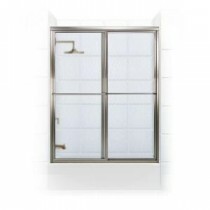 Modern, sleek lines enhance the beauty and functionality of this tub/shower enclosure product line. Easy install and easy cleaning round out this complete product for your bathroom upgrade. Bypass expands to fit openings up to 57-5/8 in.